There were notable changes in the top of all three categories at the end of the 9th week voting in the Sunday Observer/ Mobitel Most Popular SchoolboyCricketer of The year Contest.2015. 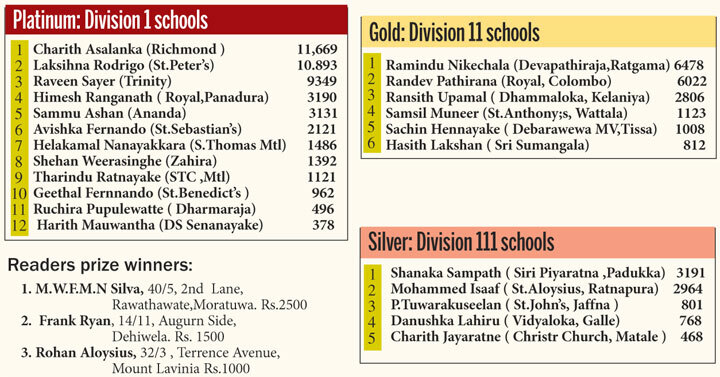 Charith Asalanka ( 11,669) of Richmond College ,Galle climbed the top in the platinum pushing last week's winner Lakshina Rodrigo( 10,893) of St.Peter's to the second spot with a majority of 776 votes. . Raveen Sayer occupied the third slot with 9349 votes. In the Gold segment last week's winner Randev Pathirana of Royal College, Colombo was displaced by Ramindu Nikechala of Devapathiraja ,Ratgama when he polled 6478 votes to Pathirana's 6022. A majority of 456 votes.